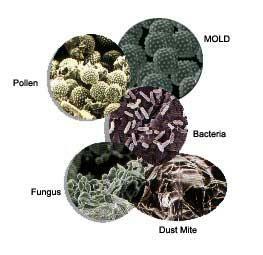 Promptly and properly repair any leaks or water damage to prevent Biological Growth In Air Ducts . Pay particular attention to cooling coils, which are designed to remove water from the air and can be a major source of moisture contamination of the system that can lead to mold growth. Make sure the condensate pan drains properly. The presence of substantial standing water and/or debris indicates a problem requiring immediate attention. Check any insulation near cooling coils for wet spots. Make sure ducts are properly sealed and insulated in all non-air-conditioned spaces (e.g., attics and crawl spaces). This will help to prevent moisture due to condensation from entering the system and is important to make the system work as intended. To prevent water condensation, the heating and cooling system must be properly insulated. If you are replacing your air conditioning system, make sure that the unit is the proper size for your needs and that all ducts are sealed at the joints. A unit that is too big will cycle on and off frequently, resulting in poor moisture removal, particularly in areas with high humidity. Also make sure that your new system is designed to manage condensation effectively. Call the professional team at Extreme Air Duct to check your duct system today.